With the start of school around the corner, what are some of your hopes for this new school year? I was astonished to learn that my nephew will be starting school tomorrow! It just seems so early; summer has really whizzed by. But it was not my nephew's return to the classroom that got me thinking about the coming school year. 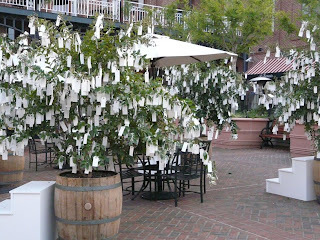 Monday, I was taking my early morning walk with my little boy and happened upon the wishing tree project here in Pasadena. 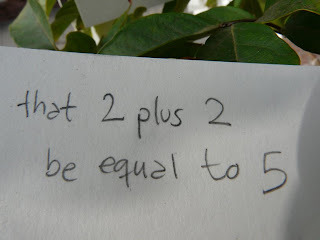 It is part of Yoko Ono's Imagine Peace project and includes about 20 trees planted in barrels and hundreds of little tags tied to the branches with wishes. 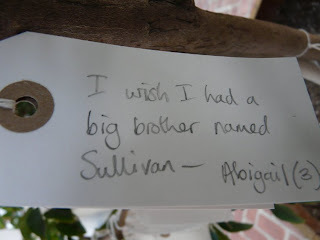 Anyone can come by and write his/her wish and attached it to a tree. 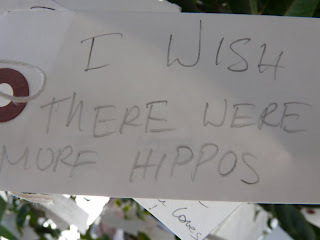 On Monday, one particular wish captured my attention but I did not have my camera. 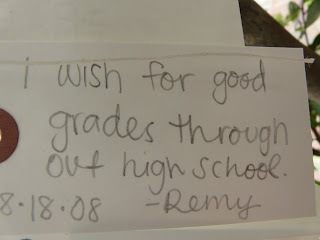 I returned today and spent over an hour reading the wishes. You can see a slideshow of my favorites at http://tinyurl.com/pasadena-wishing-tree. Unfortunately, I never found the tag that originally caught my attention. It read: "I wish I do well in calculus this year." I had forgotten how the end of summer and the looming start of a new school year brings out anxieties. Whether it is a particularly scary course or teacher, the start at a new school, the return of the bully, or just the book(s) you did not read over the summer, the end of August can be a time of worry. So here is wishing all of you a wonderful and scary-free school year. and tagged as creativity, culture. Currently, there is 1 comment. Is there some minimum level of proficiency that all teachers need to reach with respect to technology? access the technology is not available in your area. money the technology is available but you cannot afford it. ability the technology is both available and you can afford it, but you are not (or do not perceive yourself as being) able to understand how to use it. relevance you understand how to use the technology but don't see how it will benefit you. lifestyle you not only understand how to use the technology but also see how it can be used to benefit lives, but you have made a lifestyle decision not to use the technology. Given the prevalence of technology in the world today, should teachers be expected to be able to use some of this technology in their classroom and/or in managing their teaching? What forms of technology can be considered "basic" and all teachers be expected to not only know how to use but to be actually using? and tagged as leadership, professional+development. Currently, there are no comments. Do teachers need to be technologically proficient?